If you are like me, you have two daughters at home for summer vacation. I don’t know how many times a day I hear “Mommy, I’m bored,” and most of the time I feel like I don’t have the energy to take them anywhere. So I’ve been looking into fun activities for kids of all ages, since mine are 7 and 14, which is a huge difference lately. So here are 20 ideas we came up with of things to do when Mom isn’t up to a lot. 1. Have an A-Z scavenger hunt. Give each child a piece of paper with lines for each letter. Have them go around the house trying to find an item from each letter. Have a hard letter and can’t find anything? Wait until you go somewhere and try to win the game! 2. Let the kids make a fort in the living room, or their room. Let them read a book, or play with toys in their forts. If you can, go in and visit for a while. 3. Host an old school movie marathon with movies you watched when you were a kid. Make memories with them that include some of your favorite memories as a child. I know I remember which movies me and my mom watched! 4. Write a summer journal. Have a shared family journal and have each member write something good that happened that day in it. 5. Take a virtual vacation. Pick a place you know nothing about, and let your kids research about the history, the attractions, maybe even order travel brochures if available. Have kids present all the information they learned in a family night. 6. Let your daughters host you a tea party, or your kids can have a picnic inside. Don’t stress if you can’t eat – they will love just having your presence there with them. 7. Gather some family pictures and let your kids make a family photo album or a collage to hang on their bedroom wall. People love to be reminded of who loves them – let them make you a collage! 8. Cut up some old magazines and make an art journal with things you like and that represent you. Make an inspiration collage of things you want to do or things you want to achieve. 9. Make your own greeting cards out of construction paper and have your kids send to loved ones like grandparents, aunts and uncles, family friends. Help them with their writing skills if they are school-aged, and let younger ones just draw a card. People love unexpected mail from loved ones. 10. Each family member pick an animal and do a report on everything unusual and interesting they can find on the animal. Print pictures or show pictures on a computer or phone during your presentation. Try to learn something new and keep everyone interested. 11. Learn how to make slime! Keeps kids interested for hours and doesn’t need a lot of effort or time. Just search slime recipes in your favorite search engine. 12. Look up kids dance videos on YouTube and let your kids dance off some energy trying to learn the dance. Lots of laughs for you and them. 13. Let your kids give you a makeover. I know both my girls love this, it’s perfect for the little ones and the big kids! Let them brush your hair or give you a massage. 14. Put on a fashion show with the kids allowed to get anything out of anyone else’s closet to make the cutest, wackiest, funniest outfits. Give them all special titles for different categories they won. 15. Have a family sleepover in the living room and watch movies as late as you can. 16. Pull out your coloring books (and your kids!) and have a coloring party together. 17. If you are up to it, look into activities at the library. Most libraries have great free programs! Or just visit and check out books for kids to read. Have a contest to see who reads the most over the summer. 18. Have each child pick five toys to donate to someone else. Make it a project to find somewhere to donate (shelters, churches, offer them online). Feeling productive? Have them each find 10 items of clothing that won’t fit them next year or that they don’t like to donate as well. 19. Make a family newspaper. Draw pictures, share memories of things you did that week/month. 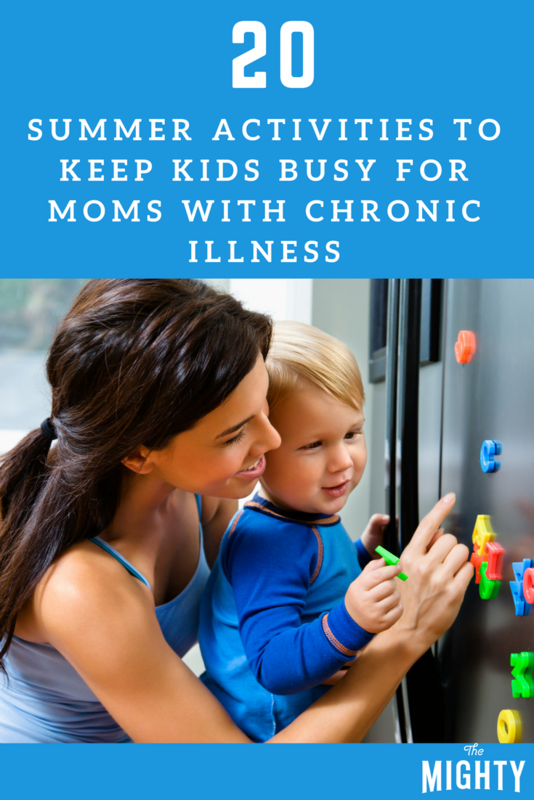 Include a family calendar and schedule movie or date nights. Let each family member figure out what they are good at and include that may it be drawing, writing, poems, anything creative! 20. Host a read-a-thon and challenge each child to read a certain amount of time per day, or a certain number of books. Make bookmarks together to motivate them to read. Have a small prize like a new book to reward the winner. I am a disabled stay at home married mom with gastroparesis and diabetes. Trying to survive this up and down life.